The Art Council’s First Friday with the Arts has been around since 2003, and with nine art galleries and at least 20 businesses participating this month, it has unquestionably gained momentum in recent years. It’s a night dedicated to some of Cape Girardeau’s finest options for local music, artistry, entrepreneurship, food and drink. The participating business are co-operatives of the Art Council of Southeast Missouri. They agree to remain open until at least 9 p.m. and create a welcoming environment for their guests. Wine samples, appetizers, live music and social interaction are readily available. Laurie Everett, owner of Annie Laurie’s and the Indie House, said when the event first started, Broadway was not yet as developed. The following is a detailed coverage of First Friday with the Arts events — four art galleries, live tunes, the Indie House and more — the night of Nov. 3. Catapult Creative House — a university-owned incubator for art and entrepreneurship — was the first stop on this reporter’s First Friday stroll. The event brings a large amount of new foot traffic to the creative house, 100 to 200 people, according to Catapult’s operations manager Leah Powers. 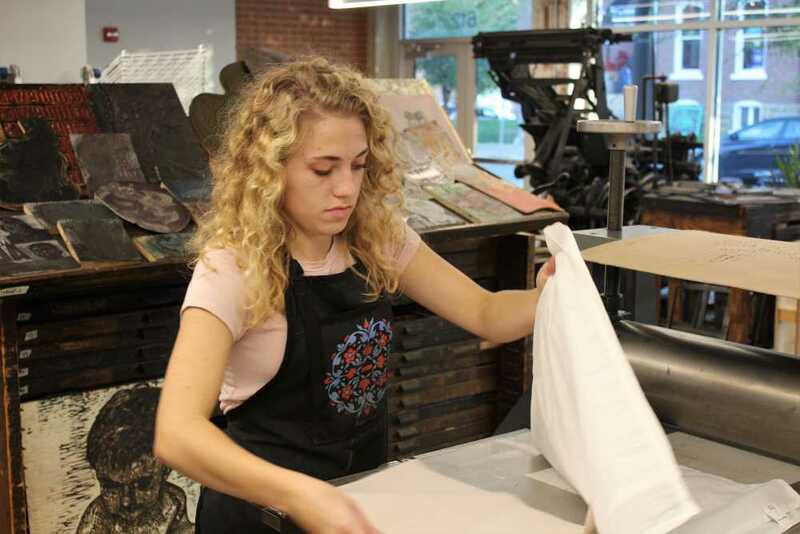 Southeast senior Jessica Lambert is the manager of Catapult’s gallery and printing press. She said she spends most of her time planning student showcases. The current featured gallery is the product of a 10-year collaboration between two professors, Tim Dooley and Aaron Wilson from the University of Iowa under the name Midwest Press. Their work centers around fast and vibrant abstract prints. Southeast hospitality majors led tours of the facility and apparently created the appetizers offered at Fuel — Catapult’s coffee shop/food bar. Assistant professor of Hospitality Management Nicholas E. Johnson, said it gives his students hands-on knowledge about planning special events. Pop-up shops are another important aspect of the creative house, promoting entrepreneurship through design. Junior Grace Bastien, a fashion and consumer studies major who works at Catapult’s pop-up shop, said it is a good way for art students to see the business side of artistry. She said most of the products for sale — shirts, posters, buttons, patches and more — were purchased wholesale from the artist. Senior, Jessica Lambert sets up pieces of paper before beginning an art project at Catapult Creative House during First Friday with the Arts on Nov. 3. Sanders’ exhibition, in the “Transition Spaces” hallway gallery, used hand quilted pieces that drew inspiration from clickbait articles she said seemed to have a large effect on recent elections. “I wanted to recreate that feeling but in a medium that’s very hand-wrought and slow — it’s not something you could pop up overnight — to put in contrast with how we innately want to believe something we read online,” Sanders said. About 100 people were present for the reception of Kahler’s exhibition in Crisp Museum. The retiring department chair said the displayed pieces were some of her most significant work. Playfulness and an ability to interact are defining characteristics of her art. Southeast junior Marqusha Oliver is working towards a Bachelor of Fine Arts in painting Marqusha Oliver said Kahler’s classes gave her clarity. Justin Miller, who teaches painting and drawing at Southeast, said Kahler was pivotal in helping him to feel welcome at the university. Miller also said Kahler has been a driving force in the fine arts department’s fight for accreditation. 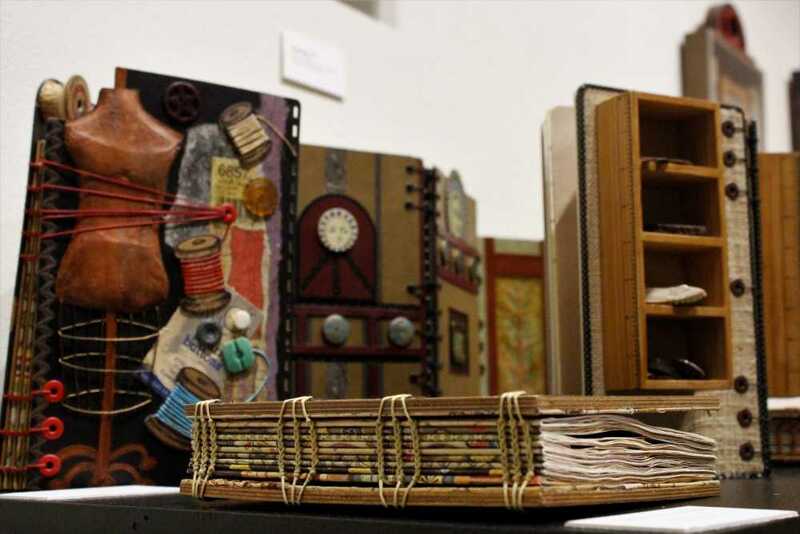 A decorated book set by Caroline Kahler sits on display during First Friday at River Campus. Next stop was the Arts Council of Southeast Missouri located at 16 N. Spanish St. for the opening reception of surrealist Randy Simmons’ solo exhibition, “Black & White: Recent Charcoal Drawings,” which includes work from his “Swimming Pool” and “Fairy Tale” series. He teaches drawing at the Paducah School of Art and Design and said he uses photos taken on his phone for inspiration. “Cape’s a wonderful town. I didn’t realize how deeply rooted it was in arts and culture here, I love it,” Simmons said. Also on display were a number of “micro-galleries.” Southeast senior Heather Robbins said her ceramic micro-gallery worked as practice for her upcoming Bachelor of Fine Arts show. She said her body of work, more than a year in the making, makes use of plant imagery and other recurring themes that mix emotion with her art. 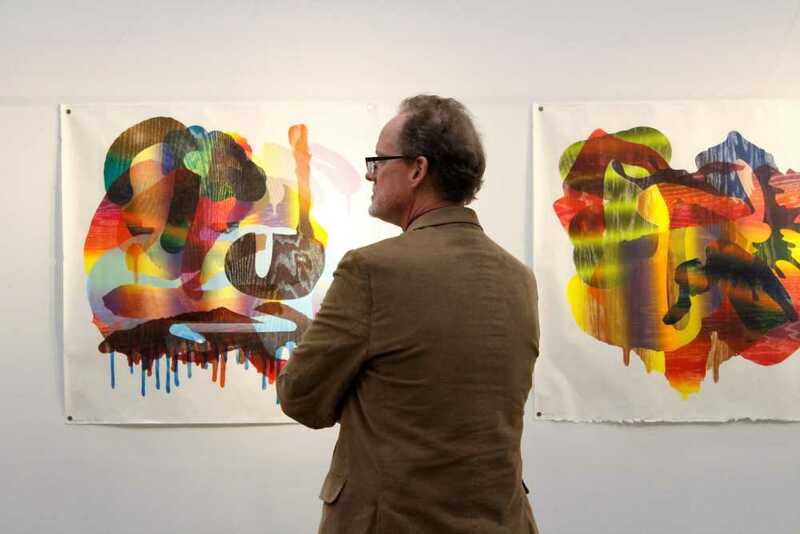 A patron observes an artwork piece displayed at River Campus during First Friday with the Arts on Nov. 3. The Indie House, at 605 Broadway St. was filled with the instrumental jazz stylings of Joseph Stacy and the warm aroma of mulled wine. Each room of the house is leased by a different boutique or vendor, with additional space for living quarters and working studios. Marti Hartle, operator of Free Spirit Studio, said she wanted more of a boutique than a formal gallery. She teaches mosaic classes each month and generally makes the sample cocktails on First Fridays. Hartle said this month’s event was all about the guys, featuring whiskey samples and a room dedicated to vintage men’s gear and clothes. An apothecary start-up business called Ember and Valor was also featured. The young owners make their recipe-based products like beard oil at Indie House. Ember and Valor co-founder Lance Debrack said he and his business partner spend 30 to 40 hours a week in their studio at the Indie House, cooking up their recipe based products. Another featured pop-up, the Cheesecake Ninja, based out of Jackson, offered a range of desserts like “flaming-hot-Cheeto cheesecake.” Amy Franklin, wife of owner Gary Franklin said that they have had success acting as traveling pop-up shop rather than a brick and mortar business. The rooms of Indie House operate as separate shops but the owner, Everett, said a conducive environment was the main idea when they bought the building two years ago. Musical performances to note at this month’s First Friday of the Arts include the “Ivas John Band” who play every first Friday of the month at the Library on Spanish St., and “Honey and Tar,” a southern Illinois Americana band that played a three hour set on the patio of Cup ’n’ Cork — only taking breaks to roll cigarettes.